The first disc by Bill Bruford's Earthworks project, this one might be a bit different for fans of his prog rock works, but it is also very solid. Bruford had always had strong jazz leanings, and made that quite clear over the years. There are even quite a few pictures of him in his Yes days wearing a shirt with the word "jazz" emblazoned on it. It should, therefore, have been no real surprise to see him launching a full on jazz ensemble. 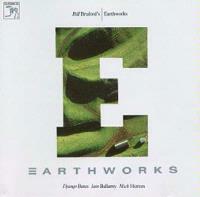 That is exactly what you get with Earthworks. Granted there are still elements of King Crimson (and even a little Zappa) that come across in the mix, but for the most part this is a highly entertaining jazz album. 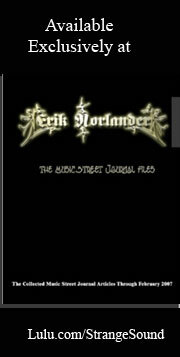 It's included in the prog rock section mainly because of Bruford's involvement. Even all these years later (it was released in 1987) it still holds up quite well. While one might expect from the title that this track would come pounding in, instead it feels like a lighthearted jazz groove with some killer turns and twists. It also includes some nice retro sounding keyboard soloing. This has a couple segments that feel like the more jazzy side of Frank Zappa's repertoire. A Caribbean type percussion starts this, then eventually the band joins in another smooth jazz jam that is quite potent. It stays like this for a while, but after a time shifts into a killer movement that feels a bit like King Crimson turns traditional jazz. Then they move it on to a nice sax solo segment that is a pretty piece of variety. This then gets incorporated into the section from before to carry it forward, uniting the elements of the composition. Another new segment, sedate yet dramatic, comes in later and the discs first elements of dissonance emerge at points here. This cut is far more dynamic than its predecessor and a great number. Starting with a slow, bouncy progression, this one builds in a more electronic sounding modern way. Eventually more traditional jazz elements emerge over this backdrop to carry it onward. As they smoothly transition the number it becomes one of the most effective and powerful jazz progressions on the album. This one is definitely the showstopper of the opening three tracks and features some exceptionally tasty soloing and textures. They move it over the course of the piece through several interesting and varied changes. The groove and sense of fun are never lost, though. Percussion starts this one, then the band comes in with a funky, killer pounding jazz-rock groove. This one is a real smoker and includes some scorching soloing. It runs through like this for a minute and a half, then drops back to near silence. A somewhat dissonant piano solo takes over from there, then the band move it into something for a short time that feels a bit like Miles Davis. After this plods for a very short period, they move back into the sedate for a time, then ramp it back up. The loud and soft passages continue to alternate with themes coming and then returning. Then a new section emerges with a moving progression where the piano seems to dance and dart about over an understated, but impressive, walking bass pattern. This gets quite involved and fast moving as it carries forward. At times the piano feels a bit like Keith Emerson's work. While this sustains the cut for a long period of time, it doesn't represent the end of the changes. They move this into an incredibly dramatic and rock oriented movement later with a pounding sort of texture. Then a false ending leads to a triumphant return of earlier more melodic themes, but still with a hint of dissonance coming over top. The longest cut on the disc at almost 7 and a half minutes, this one is also the most dynamic and one of the strongest. Feeling like a jazz take on King Crimson's "Thela Hun Ginjeet" on the rhythmic structures, the over layers seem to convey an Asian texture at times. This is a more constant jam than the one before it, but also very effective. It moves into some varying segments, but still holds its general themes, but intensifying the energy. From the opening theme it's obvious that this oddly rhythmed number is one of the best jams on the disc. The sound of the track is incredibly powerful and unusual. It's based primarily around the percussion of Bruford, but it's a musical tuned percussion. That doesn't mean that the other instruments don't get the chance to shine; they do. This is one is dramatic and another standout, even if it has some exceptionally quirky changes. It's another where I hear traces of Zappa. Bruford certainly gets plenty of opportunities to show off on this one. As always, though, he does it with class. It dissolves into dissonant chaos later. While this segment can be a bit hard to take, it can't detract from the strength of that opening section, and it still has its moments, too. They pull out into a playful sort of jazz progression from this noisy segment. Then a short reprise of the opening movement ends it. Seeming to know that the listener needed a break from the fury of the last number; they come in mellow and sedate on this with a killer smooth jazz groove. This one doesn't wander far; instead content to stay in a pretty and potent mellow mode. At less than 2 minutes, this one is by far the shortest track on the disc. It is also the strangest, composed at first of weird looped sound effects creating a wind sort of texture. A distant, tentative horn sound comes over top of this at times, and seems to fight with the noises for control. Middle Eastern tones enter late in the cut, and one quick burst of a riff takes it straight into the next cut. Building on the quick riff that started in the last cut, this moves into a killer prog rock jazz dominated jam that is one of the most entertaining and powerful on the whole album. It makes for a great closer, the band working their way over variations on the song's main themes in quite dramatic ways. This one has some of the most blatant Zappa-like segments of the whole disc, but also features some very traditional jazz (almost Dixieland) sounds of the album. This one is dynamic and very strong.